A table view displays a single column of vertically scrolling content, divided into rows and sections. Each row of a table displays a single piece of information related to your app. Sections let you group related rows together. For example, the Contacts app uses a table to display the names of the user's contacts. Cells. A cell provides the visual representation for your content. You can use the default cells provided by UIKit or define custom cells to suit the needs of your app. Table view controller. You typically use a UITableViewController object to manage a table view. You can use other view controllers too, but a table view controller is required for some table-related features to work. Your data source object. This object adopts the UITableViewDataSource protocol and provides the data for the table. Your delegate object. 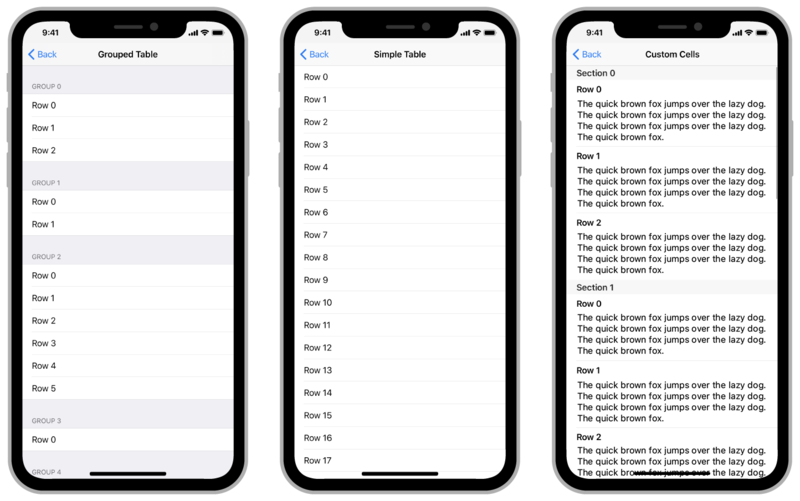 This object adopts the UITableViewDelegate protocol and manages user interactions with the table's contents. A view that presents data using rows arranged in a single column. Provide height estimates for your table view’s headers, footers, and rows to ensure that scrolling accurately reflects the size of your content. Methods for managing selections, configuring section headers and footers, deleting and reordering cells, and performing other actions in a table view. A context object that provides information relevant to a specific focus update from one view to another. Specify the appearance and content of your table’s rows by defining one or more prototype cells in your storyboard. Differentiate groups of rows visually by adding header and footer views to your table view’s sections. The visual representation of a single row in a table view. A reusable view that you place at the top or bottom of a table section to display additional information for that section. Initiate drags and handle drops from a table view. The interface for initiating drags from a table view. The interface for handling drops in a table view. An interface for coordinating your custom drop-related actions with the table view. The data associated with an item being dropped into the table view. Your proposed solution for handling a drop in a table view. An object for tracking a placeholder cell that you added to your table during a drop operation. A placeholder cell that supports customizing the drop preview parameters. An object that contains information about a placeholder cell being inserted into a table.